Author’s Note: I had such a great time at the MobWorld Summit out in Las Vegas. Wonderful to finally meet some of my readers and the fine folks I’ve been working with at the NCS. I have to admit it was pretty fun running around with Meyer Lansky II and socializing with other panelists. Thanks again to Larry Henry for putting it all together, to Geoff Schumacher of the Mob Museum for mediating my panel, and to all parties involved. Looking forward to my Mob Museum lecture in September. Check out my website to stay up to date with what I’ve got going, www.jmichaelniotta.com I hope you enjoy this newest installment. About this installment: I truly wanted to keep the connection between Los Angeles and the “mercy” killing of Guarino “Willie” Moretti a continued secret, but social media has left me little choice. You online folks are getting too damn savvy, and have already spilt some serious LCN beans. What follows was intended to be a surprise reserved for the book I’m presently co-authoring—The Early History of Organized Crime in Southern California with Richard N. Warner. Richard is actually the one that uncovered many of the documents that are referenced here. Kudos to Richard! Unfortunately, a few of you have been posting some of these incriminating federal docs online. And once its out, its out, right? In that case, lets let a large lion escape from its respective cage (that’s art-talk for letting the cat out of the bag). Beating social media to the punch, here is a small taste of what happened to the New Jersey enforcer and one-time Underboss, Willie Moretti. That being said, the finer details—some of which you will not find in Bureau of Narcotics or FBI files—will remain a secret until the coming of the Niotta / Warner book. 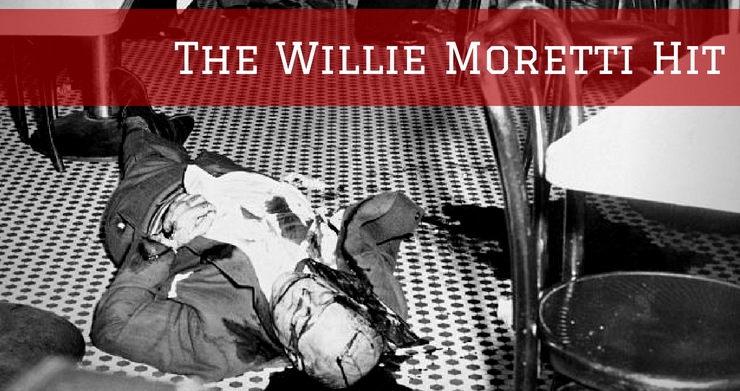 If you’ve ever watched AMC’s series, The Making of the Mob, or read any mafia book ever written about New York, Frank Costello, and Vito Genovese, then you’ve definitely heard at least one version of what happened to Willie Moretti—a man known by some as Willie Moore. Whatever the backstory, on October 4, 1951, a powerful player in the East Coast rackets met a violent end. The four men who entered Joe’s Parkview Restaurant that evening, headed straight for their mark. Drawing pistols, they quickly gunned down the infamous former Underboss of the Luciano Crime Family. Happening the year after Moretti stood before the Senate Crime Committee in Washington, DC, his murder is often associated with the colorful testimony he gave. Plainly, some folks thought Willie talked a bit too much. When questioned during the committee hearing, Willie Moretti joked about the wide spectrum of his acquaintances; not only did he call underworld figures such as Al Capone a friend, he could (and did) boast being acquainted with a variety of politicians. Not wanting to pick a side, he kidded that he rubbed shoulders with both parties, comically stating “I’m bipartisan.” Willie’s remarks even got laughs from the crime commission. But it may have been a bit too rich for his less flashy pals. Some viewed Willie’s chatty disposition as a liability. Excusing Willie Moretti’s behavior as a bi-product of poor health wasn’t something later concocted; his condition had long been known to the family Boss—his close friend, Frank Costello. And the state of the witness’s mental facilities were thoroughly briefed to the committee members prior to him ever taking the stand. In fact, attendees took in quite an earful about Willie’s medical problems. Dr. Morici, Willie’s physician, even testified about his client’s well-being (or lack thereof). According to the doc, Willie dropped in for treatment that very morning. The ill New Jersey racketeer’s visits to Morici began way back in 1943. “At that time  I had to treat him because he was becoming mentally unbalanced.” Morici provided medical care for malaria and heart problems. Injections twice a year followed this initial treatment, but the measures failed to curb his illness. Unfortunately, Willie’s state grew progressively worse. In ’46, hypertension led to Willie’s first nasal hemorrhage. Approaching his big day before the committee in December of 1950, a profuse nose bleed nearly forced him to stave off the appearance. And perhaps he should have. Sworn in, Willie stated his name, address, and line of business—“U. S. Linen Supply.” After that, his attorney John T. Sullivan immediately interjected. Mr. Sullivan. Mr. Halley, may I interrupt, please? Mr. Sullivan. Mr. Moretti has been suffering from a severe illness for many years. The committee and those in attendance had all the excuse they were ever going to get. But now it was time for Willie to finally answer some questions. The advanced stages of syphilis are generally faulted for Moretti’s undoing. Those within Willie’s secret world had either seen, or at least heard, about the havoc this affliction could lay upon even the strongest of them. Alphonse Capone served as prime example; the sickness ate his mind over a difficult period of years. Perhaps for this reason, they were sympathetic. According to authors and crime television; however, the excuse “Willie’s not well” wasn’t intended as a pardon. Instead it would serve as fuel to burn poor Willie down. Espousing a “for the greater good” sensibility, his silencing would serve two purposes—it would protect this thing of theirs while simultaneously putting an end to Willie’s misery. Words like ‘dignity’ have even been thrown around. Strangely, such rumors were able to elevate execution to the status of mercy. The excuse, “Willie’s sick,” and the opinion of his death being a mercy killing may have merely been a hush up for other activities though—and not just because Vito Genovese wanted to take over. Syphilis addled brain or not, if Willie Moretti’s associates knew—or even thought—that he’d been a rat then his funeral wouldn’t have been the illustrious and heavily populated affair that it proved to be. The grand turnout suggests that the bulk of those belonging to their secret world did not know the full story. As it turned out, Willie truly had become a liability. Proof of such surfaced in April of 1959, when Mary Gilbert of the Miami Intelligence Unit made available a recorded conversation between Willie and George White of the U.S. Treasury Department. During their private talk, Moretti clearly broke the code of omertà. WHITE: Willie, why do you tough guys keep insisting there is no such thing as the Mafia? You look silly saying that—what with what we know today. WILLIE: Of course there’s a Mafia. And I’m just what you claim I am, I’m the head man in my territory (New Jersey). But what’s so bad about that? We don’t bother anybody outside our own people. We just don’t run to the cops when someone gets out of line. We settle things among ourselves. Willie’s friends were likely not aware of this conversation until sometime after the funeral. As bad as this foul sits, Willie’s hit was sanctioned for a far deeper offense. Despite popular belief, indiscretions out West prompted his bloody undoing. Frank Costello’s performance during the committee proceedings in March of 1951 also garnered an ill response from criminal peers. Similarly, some said “Uncle Frank” talked a bit too much as well. Though televised, Frank arranged to have only his hands appear on camera. Whether or not he thought this an accomplishment, the twitching of ten nervous fingers sufficed to send a message to the hoards of home viewers. As it had for Willie, Frank Costello’s decision to wave the fifth and answer questions head-on later served as fuel; ammo for Genovese to climb the ladder. After Lucky headed to prison, Vito Genovese briefly served as the Luciano family’s Acting Boss. But a murder charge a year later forced him to flee the country, and give up the title. Convinced by the other family leaders that he could not run things properly from behind bars, Lucky agreed to allow Frank Costello to take over on a permanent basis. Willie Moretti moved up as well. When Vito returned to New York a few years later though, the lineup switched. Vito took Willie’s slot as Costello’s second. Still not satisfied with the order, Vito plotted for yet another promotion. A botched hit on Frank Costello in 1957 would remove “the Prime Minister” from the rackets and solidify Vito’s role; the Luciano family even changed its name to Genovese. Getting back to Frank Costello’s 1951 testimony, at one point the discussion hovered around an extended “vacation” his Jersey pal took out West. Where was the committee heading? Whatever their aim, they’d come well prepared, and steered Costello something poetic. Phone records showed 130 calls between California and Arkansas—the SoCal ranch Willie holed up in and Frank’s stay-over spot out in Hot Springs. What was Willie doing out West? And why was he chatting with Costello so often? Talk of Willie Moretti’s California holiday became a topic in Chicago as well. Grilled before the senate committee in the Windy City, Jack Dragna not only admitted to knowing Willie back in East Harlem, more than a half decade before the start of prohibition, he also explained that he’d run into him somewhere in New York within the past six months. When prompted about Willie’s 1942 stay out West, Jack indicated he’d seen him then as well, and even confirmed that Willie was ill. Other than establishing national connections between major players, what did the committee want from this line of questioning? Whether or not the feds had knowledge, Willie’s ties to SoCal extended further than Jack Dragna. Marriage linked him to several Italians who, although born in New Jersey, now resided on the West Coast. These former criminal associates of Willie from back East were Joe, Frank, Fred, and Angelo Sica—a set of brothers often mistakenly listed as mafia members. Despite this common contention, federal files and even members of the LA Family have described them instead as a separate entity; as freelance operators; hired guns who, when not doing jobs for the mafia or the syndicate, had their own rackets going. Two or three of the four Sica brothers dealt heavily in the Cali narcotics trade during the forties. As traffickers, they moved product from Mexico into Central and Northern California. Though known mostly for drug, muscle, robbery, and gambling activities, when a former partner sought leniency by agreeing to turn state’s witness, the brothers added murder to their criminal resume. While sitting on the couch at his mother’s home in Fresno, gunfire ended the life of drug runner, Abe Davidian. The slaying of “Singing Abe” occurred during the LA beef between Jack Dragna and Mickey Cohen, and the loud spillover delivered negative repercussions to the entire Dragna family. Fresno—Jack Dragna, the “Al Capone of Los Angeles,” and Joe Sica, his chief underling, are “up to their necks” in the gangland assassination of narcotic-runner, Abe Davidian, Gov. Earl Warren’s Crime commission declared today. Law enforcement believed the Sica brothers switched allegiances from Mickey to Jack, and the press happily printed it. It is even rumored that Jack asked Joe Sica to personally dispatch of Mickey himself. Because of Joe’s deep friendship with Mickey—as the story goes—he just couldn’t go through with it. In Mickey Cohen’s autobiography, he portrays the Sicas as his really close longtime pals, but in truth, the lot was more inclined to serve their better interests. That meant politics aside, they backed the winner; and with all the bombings and gunshot blasts going off in only one direction, it wasn’t too difficult to see who that was going to be. Obviously not blind, some dabbling in the LA rackets found themselves enticed by the profitable market. It must have been a tempting way to make a buck. Explaining this, the source intimated that if someone wanted to quietly make some quick dough on the side, they knew how. For those in SoCal so desiring, the Sica brothers topped the list of those to see. They not only knew the trade, they exercised discretion. Like the Sicas, Willie Moretti peddled dope. He was well known for it back East. And chances are, the brothers from Jersey were the ones who introduced Willie to suppliers down south during his California stay. Joe Valachi spoke a bit about how—despite strict orders not to—Cosa Nostra members dabbled in the drug trade in the New York area. Like Willie Moretti, Joe Valachi belonged to the Luciano family. And once leadership shifted, he fell under the rule of Vito Genovese. According to Valachi, Vito looked the other way when it came to the narcotic involvement of his criminal family; that is, as long as the quiet kickbacks for allowing these transactions kept coming. Drug activity under Costello would have been heavily hush-hush as well. The drug climate in other areas; however, was handled different. The debate can be chalked up to the divide between the younger minded and those still clinging to the idealism of the old country. Those often dubbed the “Young Turks”—Genovese, Luciano, and many others of their era—made a tidy sum off narcotic involvement; whereas, Joe Bonanno—a New York family leader who fell into the “traditionalist” category—professed a hatred for drugs and wanted no part of them. Bonanno’s son, Bill, explains this in The Last Testament of Bill Bonanno. Bonanno’s book also does a fair job of summing up this difference between the “old” and the “new” mentality. Those that came “to these shores as nearly grown men” had “never really lost their identities as Sicilians banding together” against “outsiders.” The younger group “were born in Italy, but came to this country as youngsters, and grew up on the streets of New York.” In America, cash was king, and making it just about any way they could became the mantra. “The boys who grew up here were never indoctrinated with the old-world philosophy, and operated without specific loyalty to any established group.” They worked with “outsiders” and dabbled in rackets the “conservatives” didn’t want to touch. Jack Dragna was a bit of an oddity in this regard. Coming to New York from Corleone at only seven and growing up in East Harlem, he had commonalities with Luciano and the others. He understood where they were coming from and “spoke their language.” And yet, having returned to the place of his birth at the still youthful age of seventeen, and spending a number of years in Sicily prior to WWI, he related to men like Bonanno easily enough. This duality lent to his ability as a natural arbitrator. In the pursuit of the almighty dollar, the “young Turks” sometimes moved in directions others did not want to follow. Though fictional, this hard decision is illustrated well by Puzo and Scorsese. In one particular scene in The Godfather, Vito Corleone must choose whether or not to use his political powers to protect Scollozzo in narcotics endeavors. Ultimately he politely refuses. Being forced into a sabbatical out West and hidden away on a ranch may have been difficult for Willie to stomach. If nothing else, the change of scenery welcomed a new prospect. He’d been nestled a few short hours from a major resource. Tempted, Willie tapped into the Mexican pipeline. Heroin. But unlike the Sicas, Willie would eventually cut a deal with the feds. Around 1950, like a lot of others, Frank Coppola faced deportation. Forced out of Kansas City, he relocated to Tijuana. Not long after this, Colonel White—whom an informant believed to be a narcotics agent from the East Coast—dropped into Baja to investigate. How did he learn where Coppola landed? “Informant advised that on one occasion, while all these hoodlums were visiting or living in Tijuana, Colonel White came there and talked with some of them.” It was deduced that “White must have had an inside informant.” After doing some digging, the source learned that “White was acquainted with the LCN boss in New Jersey called Willie Moore.” Suspicion grew. By way of a little sly plotting, the pair laid a trap, and before long Willie fell in. “By feeding false information to Moretti,” they “verified” he “was an informant of Colonel White.” Willie was the only one to hear the “fake news” they whispered. And yet, word still surfaced way out in old Mexico. A contract for Willie’s life was promptly issued.